Kathmandu Kora Cycling Challenge presented by Social Tours, a mass fund-raising charity bike ride, returned for its 7th on Saturday, July 15th. And I happily took up the challenge. And after a day of rest and work, I’m here to share my experiences with you. Kathmandu Kora Cycling Challenge is open to all ages and provides recreational cyclists an opportunity to challenge themselves in onerous routes around the Kathmandu Valley and at the same time, support a good cause. Beginning and finishing in Mangal Bazar, Lalitpur, participants could ride one of three distances – 50k, 75k or 100k routes. I have always loved to push my physical limits and the 75k ride was the perfect opportunity to do so. So early Saturday morning, we reached the venue. Well on time, as always. I was super excited for the day and so were my companions Sunil dai, Mahesh and I also met another fellow rider – Mahesh’s friend Akhilesh Hatake. We were not only excited for the ride, but also for the cause Kathmandu Kora supported this year. Proper cycling trails within reach are always welcome. The event was awesome. Even though there were over 2000 riders, we started well on time. All the people were full of great energy and I could feel all the positive vibes and energy that circulated around me. This time around, we were doing a group ride, much unlike the last year when we headed out on our own. The ride was great fun as we started. We were cautious about following the route this time and not get lost as I did the in 2016. However, this year too, we definitely missed the route by a “little”. Nevertheless, we came to do a 75k, we would do a 75k! So we went on to complete it in our own way. When I checked my Strava after the ride was over, I saw I rode 76.6 kilometers. I’m so glad I went over the limit and not under. So my Kathmandu Kora Cycling Challenge 2017 experience turned out to be better than last year’s. The day was sunny, exhaustingly so. It was very hot and the sun was actually sucking the energy from me, like in those Glucose D advertisements. I also hadn’t been riding regularly this year, so it was quite an arduous ride. Same story with Mahesh. We were much more tired than the last year. We’d been on many long cycle rides last year, but the Kathmandu Kora ride was my first for 2017. And boy, was it awesome and exacting. Sunil, as always, is unbelievably fit and didn’t have a hard time riding unlike the rest of us. Even though I felt like I was cycling at my best, we ended up so far behind him and he had to wait for us to catch up a few times too many. Huge thanks to Sunil Karmacharya for staying with the team and keeping our spirits up with your energy and enthusiasm. All thanks to him and BFit for the workouts I’ve been doing have helped me tremendously. So much that this year I surpassed my top speed from Kora 2016 and was able to hit the pedals up to 16.1 km per hour. I’ve learned that our bodies can do anything and I only plan to push myself further. All in all, my Kathmandu Kora Cycling Challenge 2017 experience was a fun and exaltating. I look forward to much more cycling trips this year through. There was also a future Kora rider who joined us midway, if only for a minute or so. 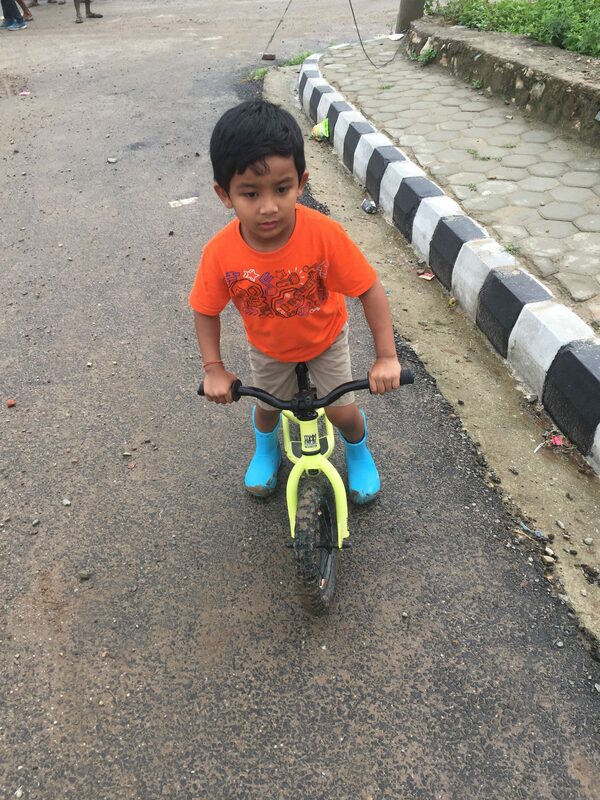 My son, Saksham, who is really enthusiastic about exercising. I genuinely look forward to Kathmandu Kora Cycling Challenge 2018. It provides me with a way to fuse together three awesome aspects – health, recreation, and charity. Ready to move from my house! *Phew* Do we look exhausted? Mahesh is all set to ride! The bike only helps him pose better. Sunil Dai all pumped up and ready to ride! A coffee break is important! 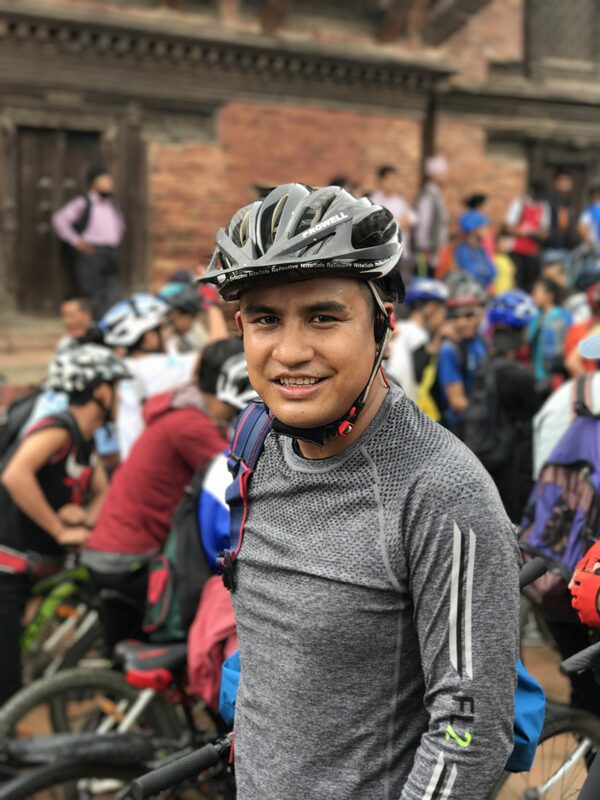 This entry was posted in Events, Life, Recreation and Fun, Testimonials, Travel, Travel to Nepal and tagged cycling, kathmandu kora, kathmandu kora cycling challenge, kathmandu kora cycling challenge 2017 by sakinshrestha. Bookmark the permalink.